Enterprise businesses typically struggle with in-house marketing. From a lack of capabilities that they can provide compared with an agency or just a gap in their inbound marketing knowledge, there are various reasons why. In marketing, particularly within inbound marketing, experience is everything. Not only will you have a scope for the various trends that have come and gone in previous years, but you’ll also be wiser to the key tricks of the trade, what to avoid and what not. Knowing the ins and outs of the market is one thing, but does your team fully understand the inbound methodology? If not, you can kiss goodbye to those unbelievable results you’re dreaming of. 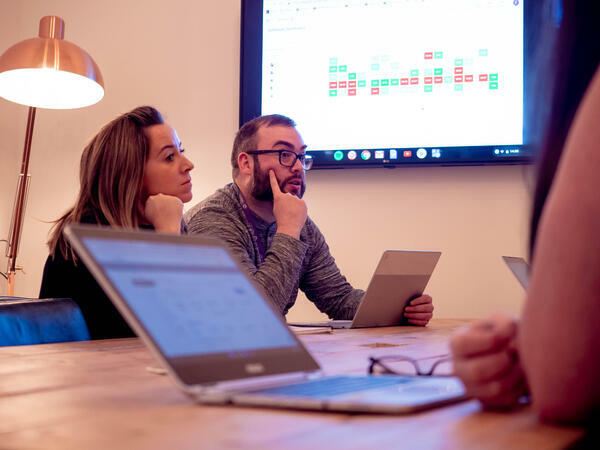 In-house teams in enterprise companies may lack the relevant experience that’s needed to implement inbound campaigns successfully - particularly if they've never tried inbound before. Whereas, an inbound marketing agency will already have years of experience that they can bring to the cause and will know the methodology like the back of their hands. After all, they’re experts for a reason. When it comes to the skills and qualities that a business may want their in-house team to have, the number of required roles can soon mount up which means that costs will be on the rise too. Without access to specialist skills, in-house teams can’t expect to reach the same heights as experts in the game. Not only will it take time to interview and hire new people for this role, but it’ll also cost money and take a while to get them trained up to full speed. And in some industries like marketing, you can’t afford to waste a second, so it’s vital that you’re always on the ball and working at full capacity. Agencies are equipped and ready to go with their own specialities as and when you need them. There should be no half efforts when it comes to an inbound campaign. In fact, you may as well not bother launching it if you can’t dedicate 100 percent of your time and effort to it. And this is why you need a specific team to focus solely on this. In theory, enterprise businesses would just ask their in-house team to look at launching the campaign but this is where they’re going wrong. It’s all well and good asking your current marketing department to look after an inbound campaign and steer it to great success, but what is the likelihood of it actually happening? Not very likely, to be brutally honest. An effective inbound marketing campaign needs a team’s undivided attention from start to finish and if it doesn’t get it, then it could be dead in the water. That’s where agencies can offer more than your in-house team. They’re on hand to support you, your campaigns and your target audience. Remember, the success of your campaign is down to your audience at the end of the day and if you’re unable to provide them with the attention they need to nurture your sales, then it’s not going to do as well as it could, is it? You’ll notice that a lot of smaller teams adopt the inbound methodology much more smoothly and quicker than larger companies. But why? Well, the main reason is because there are fewer people at the top in smaller companies making the decisions, whereas in larger companies, the message needs to be signed off by more people helping make the decisions. Sometimes, the more senior team members don’t want to deal with decisions that involve inbound marketing. These changes include trying to bring sales and marketing teams together, which if you’re not sure why you need to do it and have a low knowledge of inbound marketing, you won’t do as effectively as you should. Agencies make all the decisions for you, of course with your sign-off considered. So, in order to reduce the time between putting pen to paper with the plans, getting the ball rolling with your work and getting sign-off, agencies are a greater way of doing this. It's no secret that enterprise companies struggle with inbound marketing, whether it's pulling it off successfully or getting buy-in from the rest of the team. But there's more to it than what we've discussed in this blog. Don't worry if you still have plenty of questions when it comes to inbound marketing for enterprise companies. We’ve created a comprehensive all-in-one guide to meet all of your needs and answer all of your queries. From tips on how to run large-scale inbound marketing campaigns successfully to using HubSpot, download your free copy below and explore the wonderful world of inbound marketing for enterprise businesses.